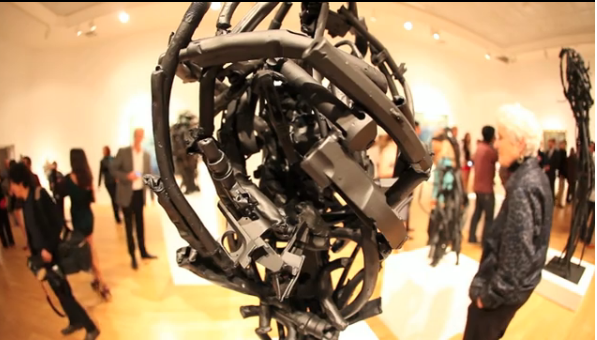 LatinaLista — Victor Hugo Zayas is an award-winning sculptor and recognized painter. Yet, for some, this Californian artist is a miracle worker — of sorts. Zayas takes illegal guns that the Los Angeles police department receives in their community gun buy-back program and transforms the weapons into works of art — and symbols of peace. …earlier this year, two tons of the guns, shredded and crushed down into a mass of twisted metal, were delivered to the artist’s studio. According to art critics, Zayas has done an effective job of infusing the natural energy that emanates from a portrait into his sculpted works of bent metal with a violent past. Earlier this year, Zayas works were on display at the Laguna Art Museum in Laguna Beach, California.